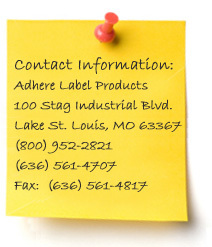 Adhere Label Products is a custom label manufacturer, specializing in quality pressure sensitive labels and tags. We offer a total in-house label printing solution from custom labels to stock labels, thermal transfer ribbons to printers. We customize all of this to meet your specific needs. We carry a wide range of label materials and adhesives for every application, as well as varnishes and laminates for ultimate label protection. We have thousands of dies in stock to create almost any label. Your labels can be supplied to you on rolls, fanfold, or sheets. You can also choose from various PMS colors or create a unique 4 color process label all your own. If you need a simple one color label or a four color process label we have the skills to meet your needs. Whether you are a current or prospective customer we’ll make you feel comfortable with over 30 years of knowledge and expertise in the label industry. We will treat you with respect and offer you the same extraordinary service levels our customers have grown accustom to today.